Ukraine's Health Ministry is drawing up legislative acts for the implementation of the healthcare reform law (on the public financial guarantees of provision of healthcare services and medicines) and the law making clinics autonomous (on improvement of legislation in the area of operation of healthcare institutions), Deputy Minister Pavlo Kovtoniuk has said. "We want to design bylaws, which would not only allow improving the procedure for making clinics autonomous, but would also allow the law the public financial guarantees of provision of healthcare services and medicines to work. In addition, we will approve auxiliary legal acts, for example, the methods for calculating the cost of healthcare services. 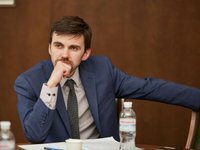 It is more required for work with the National Healthcare Service of Ukraine than for making healthcare institutions autonomous," he said in an interview with Interfax-Ukraine. Kovtoniuk said that in particular, for the implementation of the law on making clinics autonomous a bylaw on dividing the functions and powers of director and chief physician and the rules for a tender to select the director would be determined. He also predicts that after the adoption of the healthcare reform law the process of making clinics autonomous would accelerate, as heads of hospitals and local authorities understand why it is to be done.